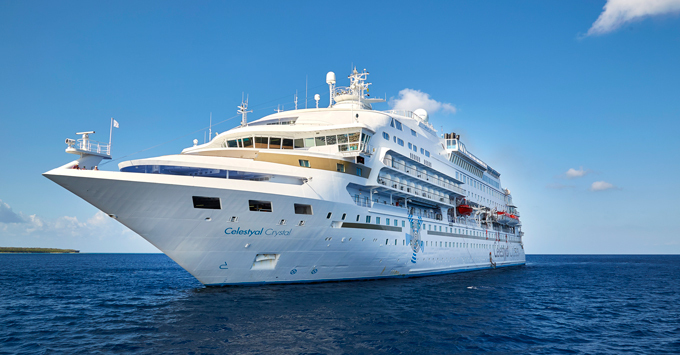 Celestyal Cruises to Feature Again in "Cruising with Jane McDonald"
(2:30 p.m. BST) -- Jane McDonald loved her round-Cuba cruise on Celestyal Crystal so much she wants to get back on the ship to film an episode for the third series of her hit Channel 5 show. The singer and TV star is keen to cruise in May next year, when Crystal will be operating seven-night Aegean cruises, including new overnights in Mykonos and Santorini. Celestyal Crystal featured in the final episode of the second hit season, in which Jane sampled the sights and sounds of Cuba. "She loved her time onboard," said Kyriakos Anastassiadis, CEO of Celestyal Cruises. "She's already said she wants to come back, so we are looking at the seven-night Aegean on Crystal in May." Anastassiadis said the Celestyal website "had never had as many hits from the U.K." as when the episode aired on September 22. He added: "We were absolutely thrilled with the number of bookings generated as a direct result of the show." Celestyal confirmed distribution deals with two of the biggest cruise specialist agents in the U.K., Iglu and Hays Travel, just before the show aired in order to cope with demand. Commenting on the Cuba cruise, Jane said: "Cuba was like being in the film La La Land. Everywhere we went people were singing and there were bands on every street corner. I was serenaded with guitars. Cubans are the happiest people I've ever met, and it was really enlightening to be with folk who love life. We blagged our way into a house party and it was like the set of Fame." Channel 5 confirmed a third series earlier this month, but was unable to say which ships or destinations would feature. The second series aired throughout September and averaged 1.7 million viewers per episode -- making it the highest watched TV show on Channel 5 on Friday nights. It also gained seven per cent of the overall TV audience on a Friday night.